Digital audio recorded give us many advantage in data processing or manipulation. However, it is also avoid violation of audio data royalty; for example illegally duplicating, cropping half or all of data and distributing without permission from owner of audio data. Watermarking technique can be implemented to protect its digital audio recorded. They primarily differ by intent of use. A watermark can be perceived as an attribute of the carrier (cover). It may contain information such as copright, license, trackning and authorship etc. Whereas in case of steganography, the embedded message may have nothing to do with the cover. 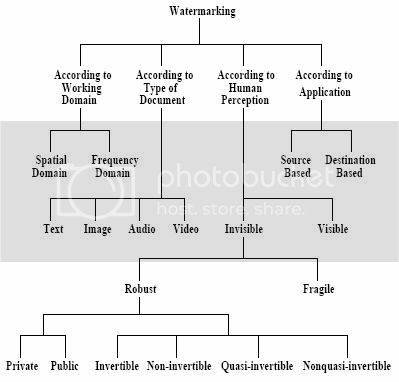 In steganography an issue of concern is bandwidth for the hidden message whereas robustness is of more concern with watermarking. Watermarks and watermarking techniques can be divided into various categories in various ways. The watermarks can be applied in spatial domain. 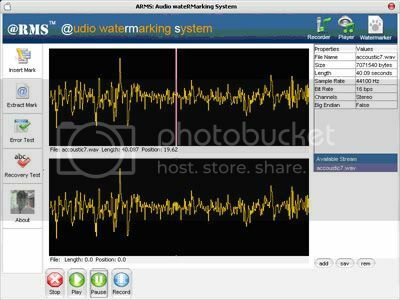 An alternative to spatial domain watermarking is frequency domain watermarking. It has been pointed out that the frequency domain methods are more robust than the spatial domain techniques. Different types of watermarks are shown in the figure below. Low-bit coding is the simplest way to embed data into other data structures. By replacing the least significant bit of each sampling point by a coded binary string,we can encode a large amount of data in an audio signal. 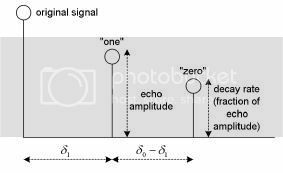 Ideally, the channel capacity is 1 kb per second (kbps) per 1 kilohertz (kHz), e.g., in a noiseless channel, the bit rate will be 8 kbps in an 8 kHz sampled sequence and 44 kbps in a 44 kHz sampled sequence. In return for this large channel capacity, audible noise is introduced. The impact of this noise is a direct function of the content of the host signal, e.g., crowd noise during a live sports event would mask low-bit encoding noise that would be audible in a string quartet performance. Adaptive data attenuation has been used to compensate this variation. The major disadvantage of this method is its poor immunity to manipulation. Encoded information can be destroyed by channel noise, resampling, etc.,unless it is encoded using redundancy techniques.In order to be robust, these techniques reduce the data rate, often by one to two orders of magnitude. In practice, this method is useful only in closed, digital to digital environments. where F represents the Fourier Transform and F¡1 the inverse Fourier Transform can be examined at two locations, corresponding to the delays of the "one" and "zero" kernel, respectively. If the autocepstrum is greater at ±1 than it is at ±0, an embedded bit is decoded as "one". For the multiple echo hiding, all peaks present in the autocepstrum are detected. The number of the peaks corresponding to the delay locations of the "one" and "zero" kernels are then counted and compared. If there are more peaks at the delay locations for the "one" echo kernel, the watermark bit is decoded as "one". In embedding test, Low Bit Coding Technique can embed data in very large of space, but Echo Hiding only can embedd small part of data. In extraction test , Low Bit Coding Technique always have recovery rate with 100% accuracy, but in Echo Hiding technique, watermark recovery rate depend on initial amplitude and cover audio used. 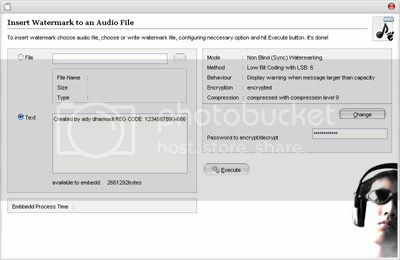 There is no change in size of audio file before and after watermarking process. In robustness test result that Echo hiding Technique have highly robustness than Low Bit Coding Technique.